BANGKOK, THAILAND--(Marketwire - Feb 21, 2013) - Full of wonder, excitement, and adventure, Bangkok attracts visitors from every walk of life, from on-the-go businesspeople to vacationing families. At the center of this popular, culturally rich destination are the Sukhumvit Park, Bangkok - Marriott Executive Apartments -- offering comfortable, multi-room accommodations for a relaxing extended stay. And for 2013, the property is offering something special for golf enthusiasts. The Sukhumvit Park, Bangkok - Marriott Executive Apartments are proud to announce the opening of Wilding Golf in its recreational area. This state-of-the-art, cutting-edge golf simulator uses the most advanced technology in the world to immerse guests in a total golf experience. Located on the 9th floor, the simulator features 11 semi-private practice bays, and combines the best of accurate trajectory physics, precise ball and club tracking, great graphics, meticulously reproduced courses and great game-play. The Sukhumvit Park, Bangkok - Marriott Executive Apartments are part of one of the premier Sukhumvit suites hotels. Conveniently located near major offices, shopping destinations and Bangkok's most famous landmarks, these five-star, fully furnished Sukhumvit hotel apartments feature full kitchens, large bathrooms and all the services and amenities guests would expect to find in a world-class international hotel. In addition to the golf simulator, the property features a 200-square-foot fitness center, swimming pools, tennis, squash, and badminton courts, to provide the ultimate in enjoyment and leisure for every guest at this hotel in Sukhumvit. Guests will also delight in personalized meetings organized by the property's professional event coordinator in one of our Bangkok conference rooms, which will ensure successful events and get-togethers. Convenient among Sukhumvit suites hotels, the property's tuk tuk service provides easy access to Bangkok's best shopping centers and BTS Skytrain routes, as well. To book a reservation at this exceptional property, or explore Bangkok hotel deals, guests are invited to visit http://www.marriott.com/hotels/hotel-deals/bkksp-sukhumvit-park-bangkok-marriott-executive-apartments/. With comfortable amenities and unparalleled service, the benefits of staying at Sukhumvit Park, Bangkok - Marriott Executive Apartments are endless. Offering stylish serviced apartments, Sukhumvit Park, Bangkok - Marriott Executive Apartments is the ideal home away from home. With spacious suites ranging from 45-130 sqm, these Sukhumvit serviced apartments have an option for families of all sizes. Guests can also take advantage of the property's 24-hour fitness center with recreational courts and an outdoor saltwater pool, unique among Bangkok city centre hotels. 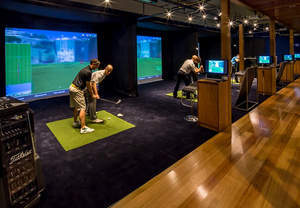 Try the new state-of-the-art, cutting-edge golf simulator at the Sukhumvit Park, Bangkok - Marriott Executive Apartments. It uses the most advanced technology to provide a total golf experience where you can practice your golf game in one of the 11 semi-private practice bays.